I have always loved walking in the rain, especially the warm summer rain we are lucky enough to experience here in the UK and I can often be heard singing renditions of all songs featuring rain. Luckily not many people venture out in the rain so I’m pleased to say I remain unheard. One of my favourite songs is “Laughter in the rain” by Neil Sedaka, but the list of rain songs in my repertory is endless. I wonder whether I have always liked rain songs because I recall a very fond childhood memory. My brother and I were staying in a hotel with my parents, when one morning at breakfast I recall my Mum excitingly telling me she’d just seen Sasha Distel and had got me his autograph. Well I kid you not, I was 13 years old and had absolutely no idea who she was talking about. She looked at my blank face and said almost jumping up and down “you do know him, you do, he is the one that sings ‘raindrops keep falling on my head’ ” and she burst into song. I still didn’t have a clue. Undeterred, she handed me a scrap of paper. It was addressed to me with his autograph. I wonder if I had always enjoyed songs about rain and she had genuinely wanted the autograph for me, or, whether she had been too embarrassed to ask for it for herself and had asked him to sign his autograph for her daughter or if it was a way to strike up a conversation with him. Whatever the reason it always brings a smile to my face when I think back to that day. Sadly I do not know where the autograph is now. So over the last week in the South East of England we have experienced unsettled weather, sunshine one minute, followed by heavy rain, thunder and hailstones the size of golf balls. This was the topic of many conversations amongst my friends, should one go out in that weather, the fair weather ones chose to stay at home, some are petrified of thunderstorms so quite rightly stay inside wherever possible. I guess this is why the British love to talk about the weather – we never know what it’s going to do next. It is so changeable. One evening after a day of such stormy weather I took my dog Alfie out in the then very light rain and naturally I sang. It was quieter than usual and there was no sign of anyone else. I reveled in how fresh everything seemed. I love the smell of rain on a summer’s evening, the scent of the apple blossom and rosehips, stronger than usual. The grass soft and springy under foot and I marveled at how fresh everything seemed after the rain. I looked up at the skies as they were clearing. It was like the angry storm clouds were now dispersing making way for clearer more settled skies. It made me think of how as humans, we sometimes have to go through some storms and turbulence to come out the other side. I am a great believer that if there is something that bothers us, we should voice our opinion and say what has to be said, deal with the problem, rather than holding onto it and then move on. Clear the air so to speak. Although we are not all alike and thankfully the world is made up of different types of people, some hold onto things and never say what is on their mind, burying their feelings deeper and deeper while others, like myself, will speak their mind. If I have something I’m not happy with I will voice my concerns, then once it is dealt with, it is like the skies have been cleared and everything is dealt with and forgotten and I move on. I believe if we ignore things that worry or bother us and bury them deep, they can fester and surely they will find an exit one way or another. Rather like a volcano erupting or violent thunderstorms and these outbursts can be of the worst kind causing much devastation. So if you have something on your mind I think it’s best to speak out. It really does clear the air. Equally, if we are going through a particularly bad time, we need to hold onto the hope that things will pass just like a storm and try to keep as positive as possible. 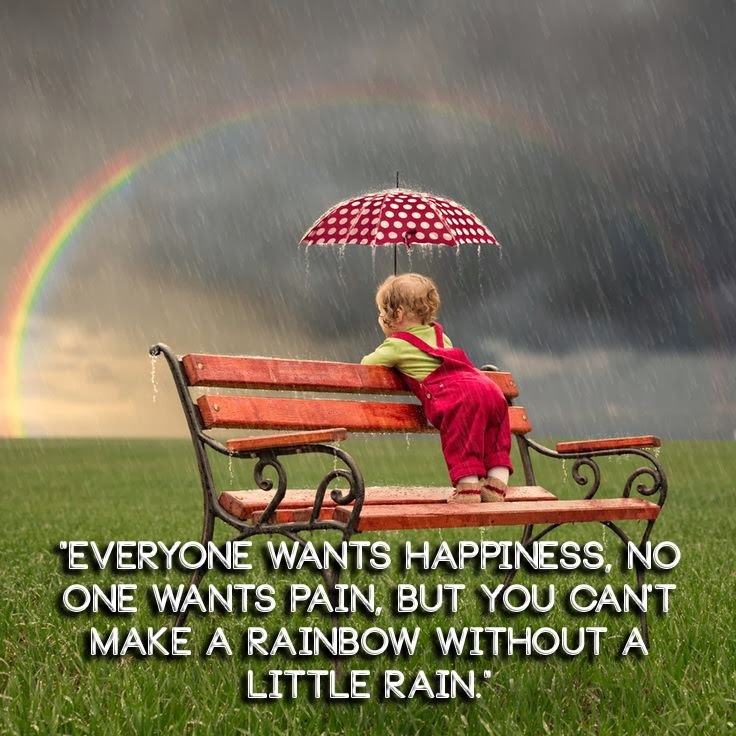 There is a very good saying that says “for us to experience a rainbow, we have to first have the rain” and I think this sums up life pretty well. I would love to hear from you if you have a favourite weather song or how the storms affect you. Hoping my readers find their rainbows this week.